OXFORD, Miss. (AP) — Two Ku Klux Klan members are facing federal weapons charges after police say the men had guns in a truck parked on the University of Mississippi campus during a protest last week. University police arrested Kyler Campbell and Virgil Dennison on Thursday, and an FBI agent said in federal court records that the men are Klan members. Campbell and Dennison — who are not students — protested as the faculty senate adopted a student-sponsored resolution asking university administrators to remove the state flag because it has the Confederate battle emblem that critics see as a symbol of racial oppression. 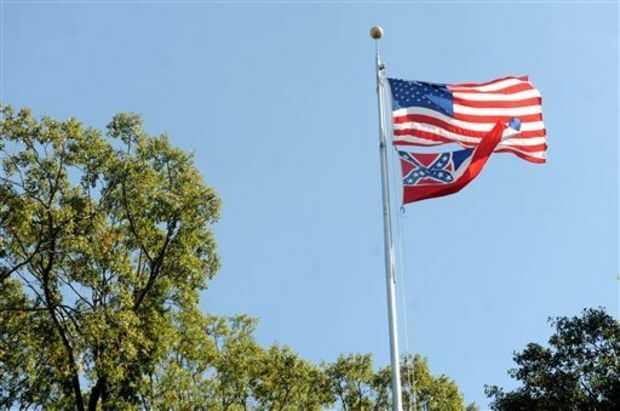 The flag was removed from campus early Monday. The men are charged with possessing a firearm in a school zone, Chad Lamar, spokesman for the U.S. attorney’s office in northern Mississippi, said Monday. Campbell remained in the Lafayette County Jail late Monday, and a call to his attorney was not immediately answered after business hours. Dennison was released on house arrest and must undergo a mental evaluation, Lamar said. Dennison’s public defender didn’t immediately return a call.